He shared photos of his injuries today. 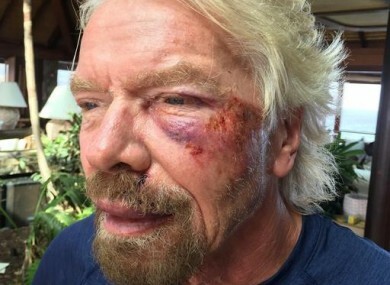 Sir Richard Branson after he was involved in an accident when he crashed his bicycle. BILLIONAIRE ENTREPRENEUR RICHARD Branson says he thought he was going to die after flying head first off his bicycle in the British Virgin Islands. The Virgin Group boss hit a hump in the road on Virgin Gorda, one of the islands in the Carribbean, catapulting him into the road. The 66-year-old Branson posted pictures of his bloodied face on social media, showing the gruesome injuries that included a cracked cheek, torn ligaments and severe cuts. Branson said he was lucky that his shoulder and cheek took the brunt of the impact. He said wearing a helmet saved his life. Email “Billionaire Richard Branson thought he was going to die after falling off his bike”. Feedback on “Billionaire Richard Branson thought he was going to die after falling off his bike”.